The husband is doing his laundry. He took that task over when he retired. But, the water pressure is low here and you can't fill the bathtub and do a load of laundry simultaneously. So while waiting I went outside to the area just east of my bathroom, pulled a few weeds took a few pics, some of which will follow. Anah continues to have problems with her hip flexor. Her mom talked to the ortho guy this morning and he says that a vacation sounds like just what she needs and so our Colorado adventure is back on. Another statement from same doc is something with which I wholeheartedly agree. He said that kids today are under too much pressure to succeed in so many areas that they have a lot of anxiety issues. And, that coaches only see these kids a body, a way to win and push push push them beyond their physical and emotional limits. The strawberries are almost done producing. I stopped cutting asparagus. Next up for harvest is the "toi choi" and since it is the first time I have grown this I am unsure about when to cut it. Will research that while in the bath. I plan to stay their for a while. Will take a book and glass of water. We got a wee bit of rain on Saturday and it has been cool and cloudy since. But, watch out for tomorrow when temps are climbing back to the 90's... UGH. I look forward to the mountains and the cool air. And yes, that is the machine on spin cycle I hear. Off to to soak away whatever needs to go. I can't wait to grow strawberries. Thanks. 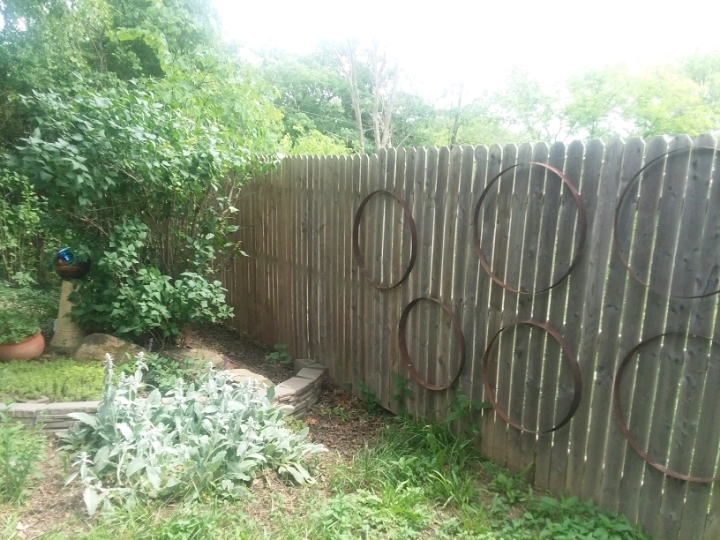 Those are the bands off an old whiskey barrel that fell apart, seemed to be a good thing to do with them. It is grest to have the strawberries, getting ready to check them in a few minutes. Love the picts! I hope you enjoyed your bath!!! Lovely garden pics. What is the flowering creeper on the fence? 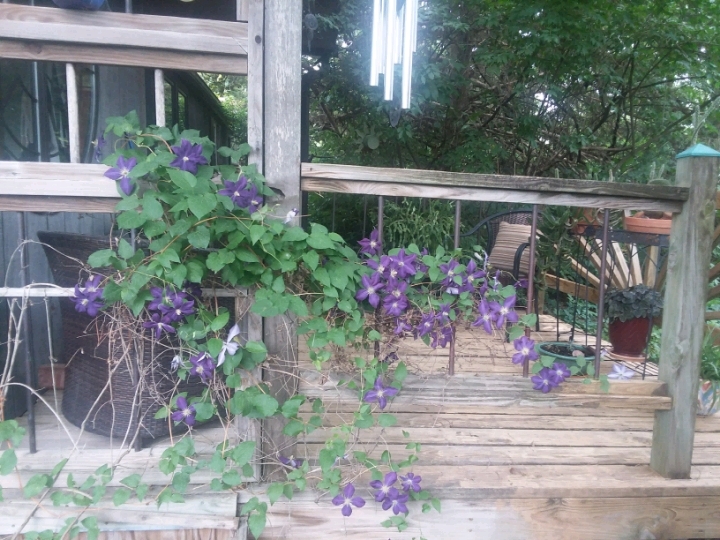 Thst is a clematis on the deck rail, glad you like the garden. Now it's my turn to have a bath...with epsom salts in! Thanks for letting me know what that plant was. I have never seen clematis. Thanks for the pic. It is very beautiful! I really enjoy all your garden pictures! 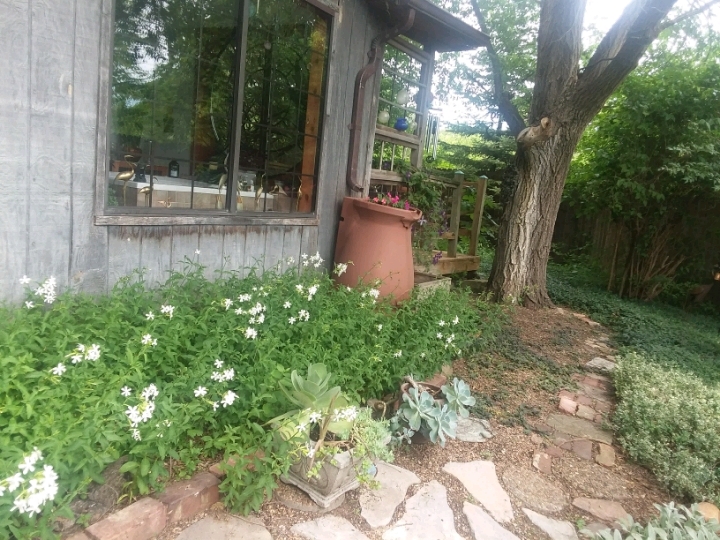 I have a few flowers and plants that I grow, but I don't have much room where I live to grow so much or have nice landscaping. All I have is a tiny flowerbed in the front and a postage stamp yard in back. So it's really refreshing to see a beautiful garden! Thanks so much. We have lived here over 40 years and have nearly 10 acres so lots of room and time to create develop the area. And, we both love to garden! Oh, I would love to have so much space! I'd plant everything! Maybe one day, but I doubt it would look quite this lovely! Dream it, and will happen!